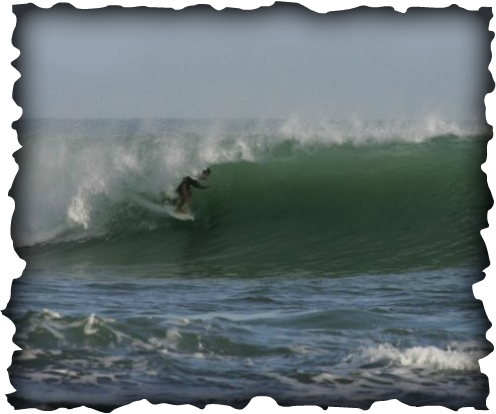 green room n. The inside of a tube - where every surfer wants to be, "deep in the tube!" gaper n. A giant, wide open barrel That was a gaper. garbage n. It is what it is. The surf has been garbage for a week. gassed v. Wiping out, getting worked by a wave. geek n. A badly behaved surfer, often a novice who isn't aware of surfing protocol. That guy who dropped in on me, and wiped out, is a real geek. geeky adj. A description of a geek's behavior. That was a real geeky move. get air, getting air v. When the surfer and his/her board are propelled up above the wave/water. get pitched v. To be thrown into the air by the wave. getting caught in the white water v. When churning, white water catches a surfer from behind. the inside breaking waves, he/she gets hit by big a clean-up wave. getting way back v. To be deep in a tube. get tubed, gettging tubed v. To ride inside a tube. get worked v. To be churned up and spun by a wave on a bed wipeout. 'That last wave really worked me." left breaks in the world. glass n. The outer coating of a surfboard. v. To apply the outer fiberglass coating to the shaped foam of a board. To glass a board. n. Water that is smooth. glass-job n. The process in surfboard making when the outer fiberglass coating is applied. glass-on-fin, glassed-on fin n. A fin/fins that are permanently attached to the board. glassout n. When the surface of the water is perfectly smooth and ideal for surfing. glue foot n. A term for a surfer that almost never falls off the surfboard. gnarly adj. Dangerous, treacherous. Big waves with big barrels. "The waves are really gnarly today." go for it A term synonymous with 'go ahead", "do it", "take off" (on a wave), etc. "Go for it Dude!" go/going high on the wave v. To surf high on the wave, up by the lip. going off v. When waves are breaking consistently and good. " The waves are going off today". go into Zen v. When, after a large or bad wipeout, the surfer relaxes and doesn't panic. Gold Coast n. Australia's east coast in the state of Queensland, from Southport to Tweed Heads. Paradise. Famous for it's point breaks. go-out n. A surf session. greased adj. To be wiped out or trashed by a wave. green monsters n. Very large waves. green room n. The space inside a tube, especially large ones. "I was deep in the green room." gremlin/grem n. A beginning surfer. grinders adj. Big, powerful waves. protects against beach erosion. They will ofter create conditions that generate waves. grommet/grom n. A young surfer who spends all his/her time surfing. ground swell n. Waves that are generated by far off storms. gun n. A surfboard designed for very large waves, as in Hawaii, that are long, thin, and tapered.